Sunrise is officially at 6:45 a.m., but the sun doesn’t begin to penetrate the bottom of the canyon where we are camped until considerably later. It’s cold, and we are more reluctant to emerge from the warmth of our sleeping bags than normal. Without ever leaving their cozy confines, we can tell that the temperature is even colder now than when we went to bed last night. We unzip our bags just enough to pull our cold hiking clothes in, hoping that this will help take away some of the chill before putting them on. After a few more minutes of playing possum, we give up and get dressed as fast as possible. Our quick movements help generate a little body heat. We reach for our shoes and discover that they have frozen overnight. We are able to make the shoelaces stick straight up like Pippy Longstocking’s braids. We find this pretty amusing until we remember that we have to put these frozen shoes on our feet before we can go anywhere. 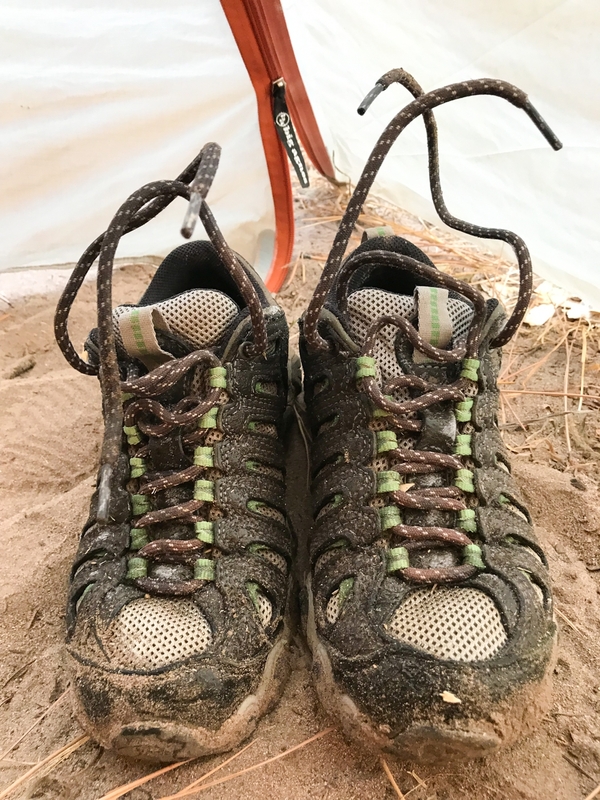 We slip into our Crocs for the time being and make a dash to retrieve the bear bags before diving back into the tent to boil water for coffee and tea. 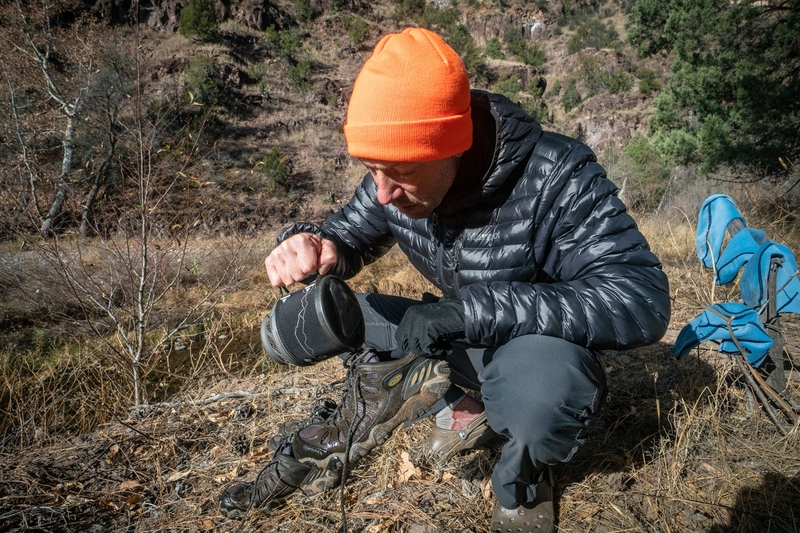 After packing up camp, it’s finally time to deal with the harsh reality of our frozen footwear. We decide to boil some more water to pour over our shoes in hopes of thawing them out, which does the trick. Shoes on, there’s nothing left to do but start walking. Within minutes, we tackle the first of some two dozen river crossings we’ll face today, and our feet, once again, are ice cold. 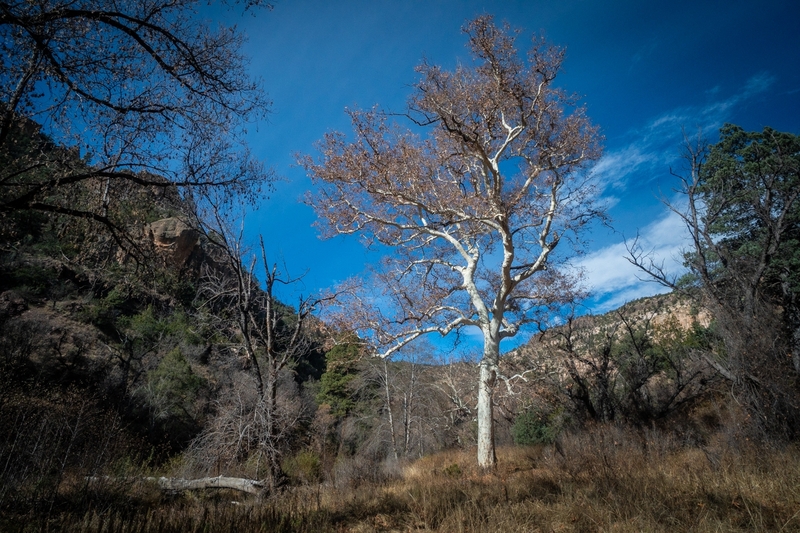 For the rest of the morning, we follow the Middle Fork of the Gila as it twists and turns deeper into the wilderness. The trail is unmarked but generally easy to follow despite the damage caused by the constant flooding that plagues this area. Luckily for us, a Forest Service crew has been out this past year to clear the trail of large debris, and the many hikers who have come before us have built cairns to help with route finding. 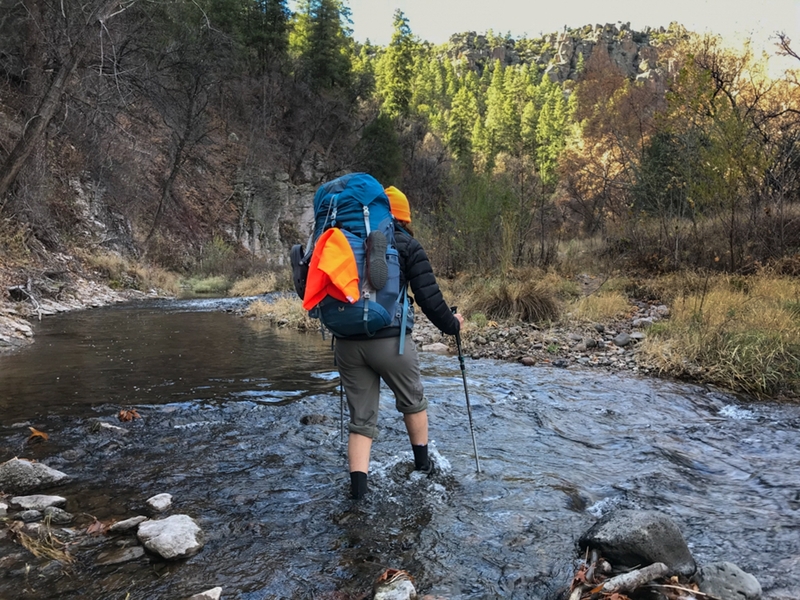 Overall, it is not too difficult to find the way, but each time we come to a river, we make sure that we can sight the trail on the opposite side before stepping into the water. 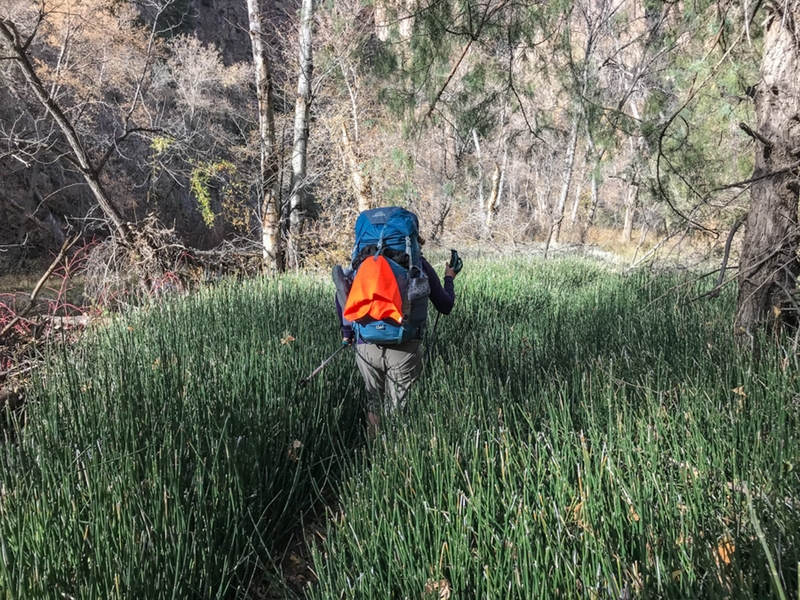 Our biggest problem is that the vegetation lining the trail has become slightly overgrown, and the constant brushing of it on our bare lower legs is beginning to irritate our skin. The scenery of the Middle Fork is attractive, but we don’t have the luxury to linger since we have to keep moving to maintain some circulation in our feet. At times, the increasingly steep canyon walls press in on both sides. This reminds us of the Narrows on the Virgin River in Zion National Park, except that we have this river all to ourselves. The combination of the solitude and the trying elements make us feel like we are on a genuine adventure, a true wilderness experience. At this time of year, the angle of the sun is sufficiently severe that some bends in the river no longer receive any direct sunlight, keeping the temperatures in these dark corners hovering right around freezing. 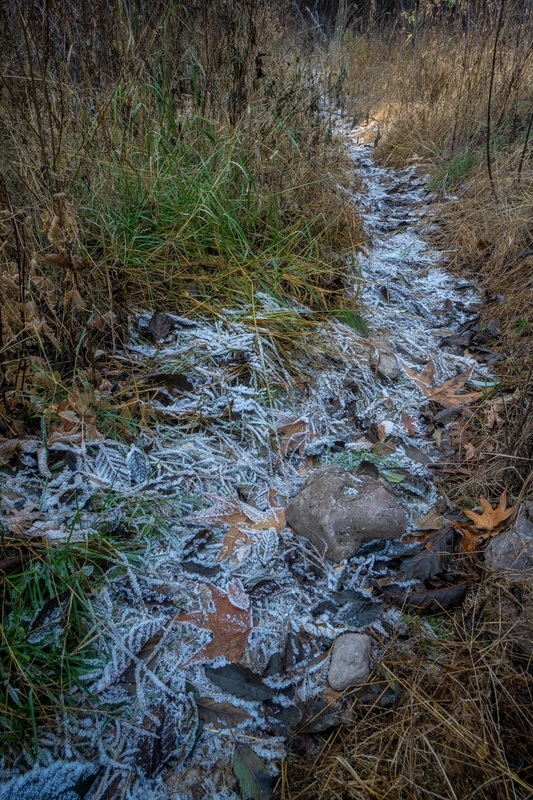 Occasionally, we run into patches of ice and frost on the vegetation, which helps reinforce just how cold we are feeling. The sycamore trees with their white trunks and fading reddish orange leaves remind us of the weirwood trees in Game of Thrones. Clearly, winter is coming. By late morning, we reach the junction to Little Bear Canyon and take a short break. There are several good campsites here as well as an impressive fire ring. 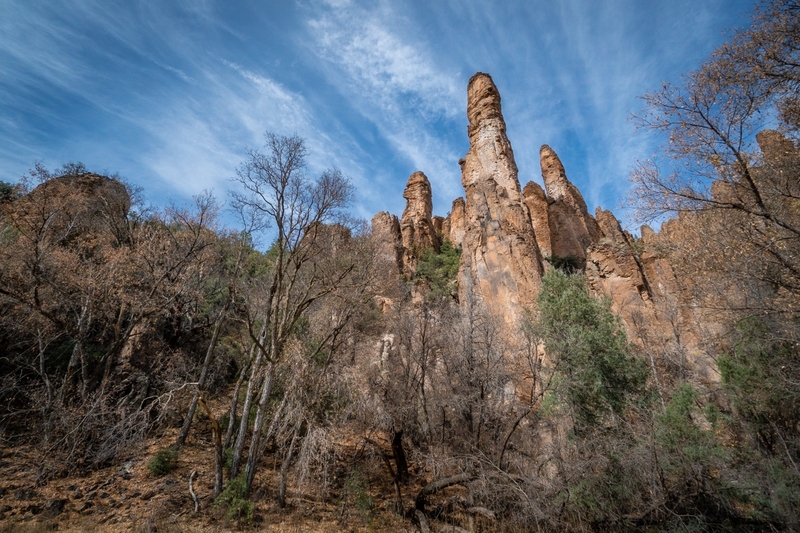 Our guidebook mentions that Little Bear Canyon is an attractive slot canyon, and, if we had more daylight to spare, it would be cool to explore. 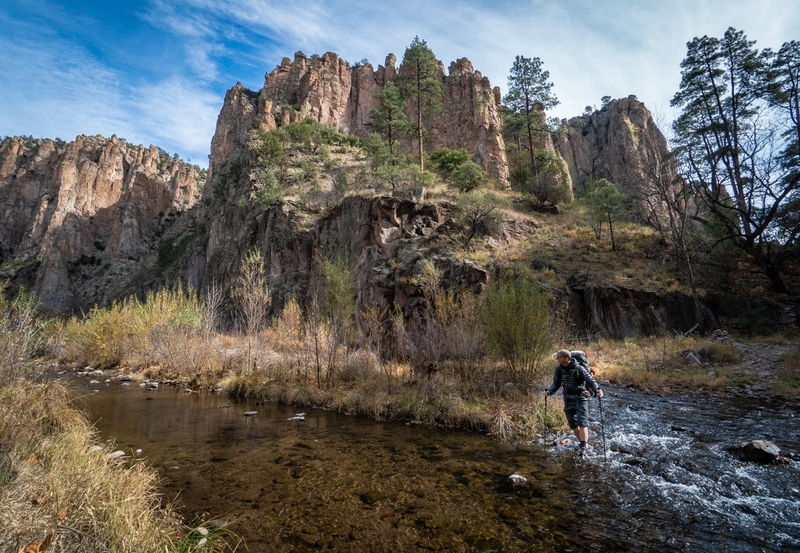 We read that this could have been an alternate land-based way into the Middle Fork, allowing us to avoid many river crossings, but what’s the challenge in that? We gather our things and continue our way down the river. The New Mexico scenery continues to astound us as we pass beneath hoodoos, goblins, balancing rocks, caves, and other interesting rock formations towering high above. Eventually we make our way to Jordan Hot Springs, the end destination for many who travel this trail. 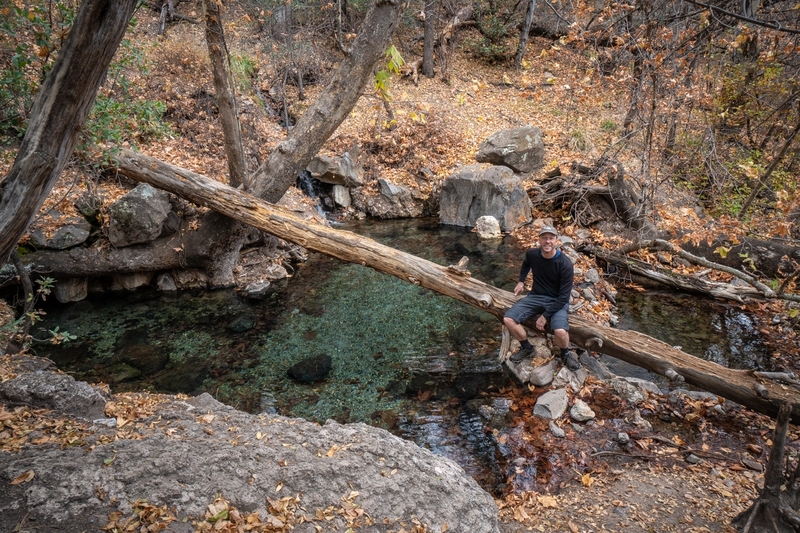 This hot springs pour out of an opening in the hillside above the river, where the warm waters collect in a series of pools. The water is aqua blue and, on the surface, rather inviting. Our guidebook, however, warns us not to submerse our heads or inhale any of the water through our nostrils. Apparently, a brain-eating amoeba thrives in this environment. We love a good hotpot soak as much as the next hiker, but the dire warnings of meningitis keep us content to wade in only up to our knees. Still, the warmer water thaws out our toes for the first time today and the delightful glade makes a pleasant lunch stop. 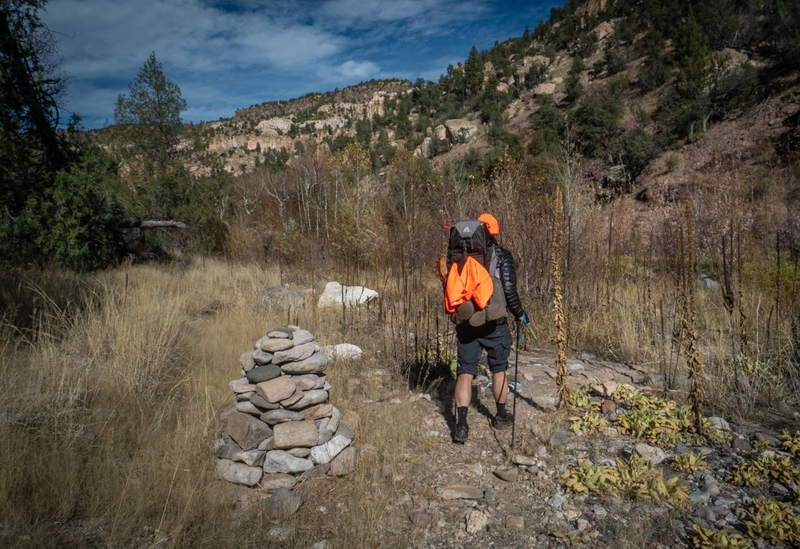 It’s here that we admit that our progress along the river is much slower than we expected and that any hopes of completing a 55- or 40-mile loop in only four days of limited daylight is more than we can realistically accomplish. The guidebook warns us that the going will get slower the farther we get down the river, and we realize that we are trying to judge this route based on the many land-only routes we’ve backpacked. River walking is a totally different experience! After Jordan Hot Springs, we’ve got about 2.5 hours of daylight left before we’ll need to find camp, so we kick it into high gear and do the best we can given the conditions. At one point we pass through “fields” of marsh reeds that normally wouldn’t faze us, but we’ve got our pants rolled up to our knees because of all the river crossings, and the stiff, frost-covered reeds lash our lower legs as we wade through them on very narrow footpaths. Our shins and calves turn bright red and sting in pain. As advertised, the trail gets harder and harder to follow the farther we go. At one point we are scrambling over some boulders, not sure that we are on the right side of the river. We arrive at a sandbank with enough flat space to pitch a tent, and, given the rapidly fading light, we decide that this will be our camp for the evening. 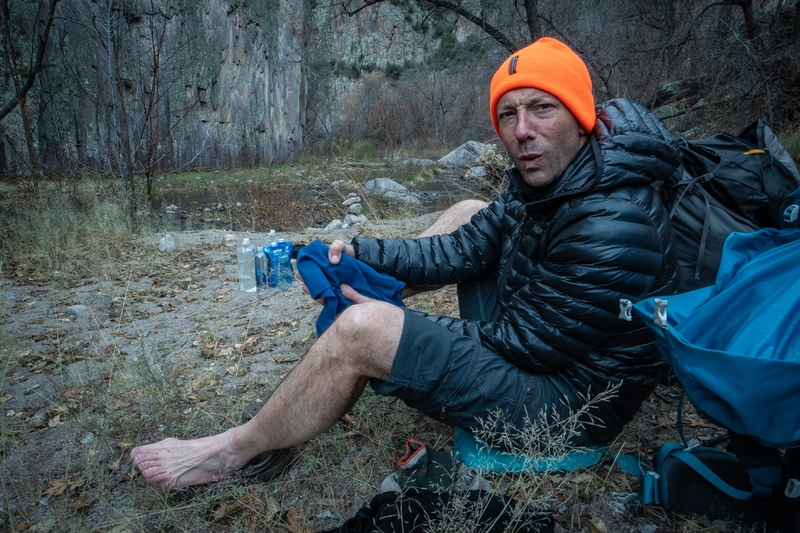 We quickly throw up the tent, filter water, and get out of our cold, wet shoes. Our feet are painfully cold. We wonder if we will ever be able to warm them up. We layer up and gather firewood so that we can warm up and pass a few hours outside the tent. Thankfully, there is plenty of dry firewood in close proximity. We fashion a fire ring and get the tinder lit and, before long, have another blazing fire to warm our hearts and toes! Hi! We are Matt and Alison, two Chicago-based school teachers with an insatiable passion for hiking and photography. We spend our summers hiking all over the world and the school year planning our next big adventure! For the past dozen years, we have been on a mission to hike/trek/backpack the classic hikes of the world, documenting our journeys with countless photos of the gorgeous scenery and fascinating cultures we encounter along the way. We have written two books related to hiking, Plan & Go: The Wonderland Trail and Hiking Photography (Sandiburg Press).